Like a Hot Rod Deluxe that’s been shrunk! 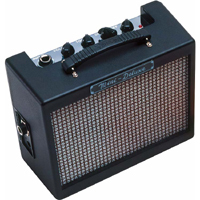 The Fender Mini Deluxe Amp has a level of detail unmatched by any other mini amplifier. Functional “dogbone” handle, chrome control plate, mini chicken-head knobs. And the Mini Deluxe has Fender tone, too! Quality amp at under £25. Awesome sound and a lot of volume for the price, it’s got little man syndrome – it punches through and sounds great.